In 1955 we set out to become Canada’s best manufacturer of skylights and solarium systems, not the largest. Today we are both, due to our tradition of smart engineering, product innovation, quality craftsmanship, and prompt, courteous service. Columbia has emerged as one of North America’s leading producers of commercial and residential skylight systems. Our portfolio of products include a comprehensive line of residential and commercial skylights utilized in the construction of shopping centres, airports, convention centres, hospitals, hotels, custom swimming pool enclosures, custom luxury residential homes and much more. Our commercial unit skylights have been included on Costco, Home Depot, and Rona stores. They have been used by leading general contractors in Canada and the United States on industrial manufacturing and distribution buildings. Modular home and recreational vehicle manufacturers have successfully incorporated Columbia’s skylights into their design. Finally, hundreds of thousands of North American home builders have included Columbia’s residential skylights in their homes since 1963. We have proudly distributed our skylight and solarium systems to four continents. Your choice of a Columbia skylight or glazing system will add value and prestige to your project. 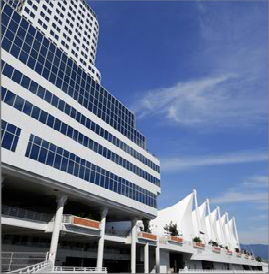 Columbia Manufacturing owns and operates two facilities located in Burnaby, British Columbia as well as a distribution centre and sales office in Mississauga, Ontario.